The team walked away with the best season in Lakeland history. 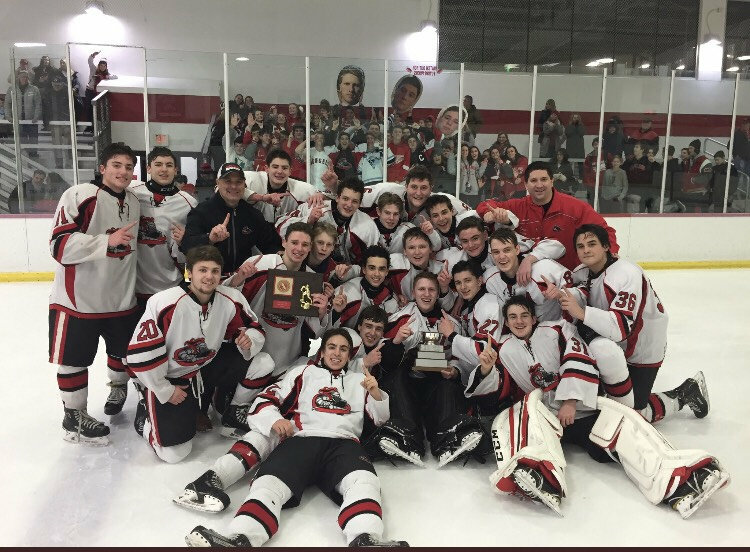 The 2018-2019 Lakeland Hockey season was a great one, with a great record of 19-5-1 – arguably the strongest in Lakeland’s hockey history. The team saw many accomplishments this season, making it to the state quarterfinals and bringing home a county championship. According to senior player Thomas Coiley, their 19-win season would not have been possible without senior Luke Joyce, who put the team on his back whenever it was asked of him (read about Joyce’s post season honors); junior Matt Coiley, who led the team in goals; and senior Jason Paragallo, who carried a big load on defense. Senior Drew Lorenz with junior and sophomore Bobby and Joey Wogisch also put in amazing offensive performances throughout the season. LRHS hockey started their season off to a rough start, with a 6-3 loss to Mahwah. They battled back and went on an eight game winning streak until they tied Morris Knolls 2-2, but followed that up with another two wins. They brought their fantastic season into the NJSIAA state tournament as the 3rd seed. They had a bye the first round, and played 14th seed Glen Rock in the second round. The game was scoreless after the first period. Lakeland then scored in the second period, leading 1-0. Lakeland outscored Glen Rock 3-1 in the last period, and won 4-1. Bobby Wogisch scored two of the four goals for Lakeland. With the win against Glen Rock, Lakeland’s next game would be quarterfinals against 6th seeded Chatham. Although Lakeland lost this game, bringing their season came to a close, they walked away with the best season in Lakeland history. With their 19-5-1 record, Lakeland looks to build on what they did this year and achieve their number one goal next year, winning a state championship.